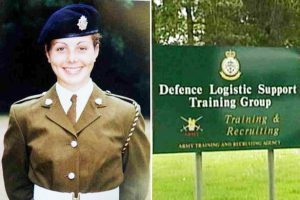 THE family of Private Cheryl James could push for a public inquiry after the latest inquest into the 18-year-old soldier’s death at Deepcut Barracks in 1995 delivered a verdict of suicide. in Woking, during which time testimonies were taken from more than 100 witnesses. Pte James died from a gunshot wound to the head almost 21 years ago, when the original inquest recorded an open verdict – this was later quashed by the High Court. At the conclusion of the latest hearing last week, Mr Barker ruled that the wound was ‘self-inflicted’ while Pte James carried out a lone patrol at the base off Brunswick Road. However, he did add that the Army had failed to recognise the dangers of self-harm that soldiers face when carrying out guard duty alone. Mr Barker said: “Ms James should not have been on armed guard duty alone. Pte James’ father Des said it was not the end of the road in their pursuit for justice, and will consider a public inquiry. In a statement he said that the inquest suffered terribly from being 20 years too late, and that from the beginning the focus of the Ministry of Defence and Surrey Police had been ‘damage limitation’. Detective Superintendent Adam Hibbert of Surrey Police said that the death of Pte James was a tragic loss of a young woman’s life. “We recognise this has been compounded for her family and friends as a result of the way her death was subsequently investigated,” he said in a statement released on the day of the coroner’s verdict. “The force has long accepted mistakes were made during the initial investigation. The force should have maintained primacy for the investigation into Ms James’ death and has previously apologised to the family for those errors. Today, we reiterate that apology. “A dedicated team of officers and police staff have been working for the past two years to disclose all relevant material, which amounted to almost 8,000 documents, to support the coronial process. “Due to the huge amount of documentation that had to be reviewed, this has been a necessarily detailed process which was not possible to do quickly. However, we recognise this has meant it has been a challenging time for Ms James’ family. Pte James, from Llangollen in North Wales, was one of four recruits to die at the Princess Royal Barracks training complex between 1995 and 2002 – all were aged 17 to 20.